General Release Notes from the January 16th 2017 update. Implemented changes to the Users screen in properties. A pop-up will appear when attempting to delete a user warning you to instead terminate the user. Also implemented a checkbox to show terminated users. Implemented the ability to rename encounter titles within the encounter window. Implemented the ability to add links for referring and PCP phone numbers. Implemented the ability to designate a nickname or preferred name for a patient. The nickname will primarily appear in the patient chart and scheduler, and a link for nicknames has been added for use in templates, dashboards, etc. 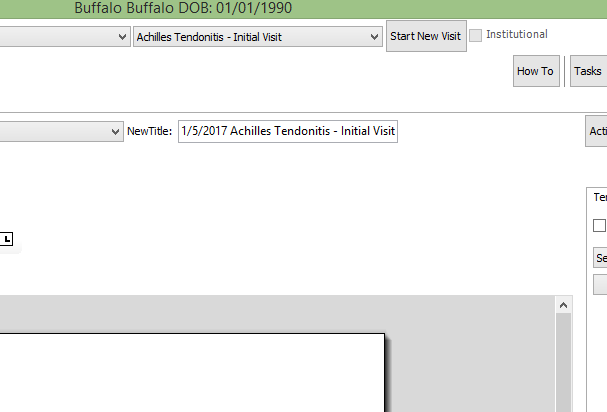 Implemented the ability to add, modify and remove patient appointments from the patient chart. Also implemented the ability to link an appointment to an existing encounter. Implemented automatic saving of charges and payments in the invoice and payment screens to improve the speed and efficiency of billing. Implemented the ability to upload PQRS measures to the MedXpress registry. Implemented the ability to use signature pads in visit notes and other forms. Resolved an issue wherein some eligibility information was not being brought into the integrated eligibility platform from Trizetto. Resolved an issue wherein the Treatment Code Analysis query was not displaying accurate data. Resolved an issue wherein, under certain circumstances, the Payment Receipts reports would not be executed for certain days. Resolved an issue wherein summaries sent through the CCDA button in the patient chart did not include patient education links. Resolved an issue wherein encounters created before 2011 were printing with incorrect margins. Resolved an issue wherein the Patient Alerts query was not displaying accurate data. Resolved an issue wherein the Payment Receipts reports were not displaying accurate data. Resolved an issue wherein the Patient Credits - Payments report was not running. Resolved an issue wherein lengthy modifier descriptions were extending off of the screen when selecting modifiers in Charges - Edit Mode. Resolved an issue wherein certain Clinical Quality Measure reports were displaying different data depending on if the report was executed by itself or with other reports at the same time. Resolved an issue wherein, under certain circumstances, tables displayed inside of links such as HPI were not displaying current data. Resolved an issue wherein patient forms were not saved if they are not assigned to a folder. Resolved an issue wherein the Patients by Diagnoses query could not be filtered with stand-alone ICD-10 codes. Resolved an issue wherein copied notes were not displaying current data unless the encounter was refreshed. Resolved an issue wherein batch-printed encounters displayed blank pages if 2.0 encounters were printed within the batch. Resolved an issue wherein the patient search would not execute if searching for a patient last name containing a space. Resolved an issue wherein mailing labels would not print if the patient had a nine-digit ZIP code. Resolved an issue wherein single payments from 2.0 showed an incorrect remaining amount. Resolved an issue wherein links to forms such as HPI or Instructions were broken if they only contained an image. Resolved an issue wherein links from older notes and notes copied from older notes did not use blue link highlighting to denote completed links. Resolved an issue wherein, under certain circumstances, the past medical and past surgical history lists were not fully displayed. Resolved an issue wherein patients sent from the patient portal were incorrectly marked as having an updated race. Resolved an issue wherein patient referral authorizations loaded slowly on the TRAKnet Cloud. Resolved an issue wherein PQRS Measure #131 did not appear on registry export files. Resolved an issue wherein the patient age in regards to age-conditional PQRS measures was based off of the report date and not off of the encounter date. Resolved an issue wherein, under certain circumstances, encounters could not be closed after editing charges in the invoice tab. Resolved an issue wherein copying visit notes would take a long time if a large number of links were on the previous note.